While doing some research recently for a Bible study, I discovered something really special about spiritual gifts. I love it when God opens my eyes and I see something that I’d never really thought about before. His Word is such a wealth of treasure! 1 Corinthians 12 is a wonderful chapter, teaching us how the body of Christ works. Paul compares the church, the body, to a physical body. He explains how each one of us are individually gifted with spiritual gifts, given for the common good of all the body. He reminds us that no one is more or less important than anyone else, just as we would not decide suddenly that our fingers were not as important as our heart! Each member is precious to God, and important in the sovereign plans and purposes of His kingdom. In the past when someone mentioned “spiritual gifts” I attributed them to the Holy Spirit, and rightfully so. I never really thought about God the Father or Jesus the Son as personally connected to the gifts. I realize that God is One, a Triune God, and that whenever we speak of the Father, the Son or the Holy Spirit, we are speaking of the same God. But scripture definitely teaches that God has revealed Himself as a Triune God, and that each Person of the Trinity has separate and distinct personality and function. And it helps us understand God a little better to relate to Him in these personal ways. So if we’re talking about spiritual gifts, we’re talking about the work of the Holy Spirit, right? There are varieties of gifts, but the same Spirit. There are varieties of ministries, and the same Lord. 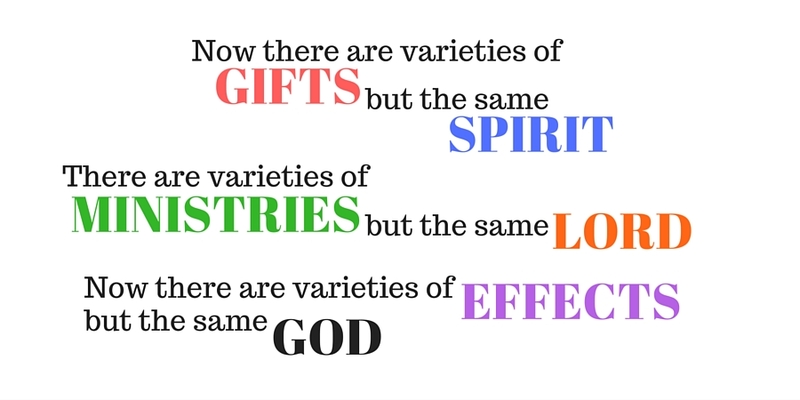 There are varieties of effects, but the same God. Here we see that spiritual gifts are not just about the work of the Holy Spirit. Whenever we see “Lord” in the New Testament, it almost always refers directly to Jesus. And “God” usually refers to the Father. The entire Godhead, the Trinity, is personally and intimately involved in our spiritual gifts. Gifts have their source in the Spirit. The Spirit gives us the power to accomplish the work of the church. A spiritual gift is the ability, desire and power to do something. The Spirit decides what gift(s) we need, and distributes to each one individually, just as He wills (1 Corinthians 12:11). But those gifts remain unseen until we put them to use. How do we put them to use? We minister! Ministries are the presence of Christ in the world, as the church serves as His hands and feet, ministering in His name. Christ is the supreme example of a minister. While in Heaven, He possessed all of the ability and power to save us. But it wasn’t until He actually came to earth, lived, died, and was raised, that salvation was finally accomplished. He ministered to us by His work on the cross. In the same way, our spiritual gifts are manifested, or revealed, as we minister as if Christ Himself were ministering. Paul says it this way in 2 Corinthians 5:20: Therefore, we are ambassadors for Christ, as though God were making an appeal through us; we beg you on behalf of Christ, be reconciled to God. The resulting effects accomplish the purpose of a Sovereign God, working out His plans through the body of Christ: reaching the world with the gospel, manifesting the glory and wisdom of God. To accomplish exactly what pleases the Father. Very often we feel that we don’t have much to offer the kingdom of God. We think that other people are more gifted, more spiritual, and just have it together. We feel our lives are messy and unproductive, and that we will never accomplish much for God. Our enemy lies to us, telling us we are pretty useless! The next time those thoughts come, remind yourself of these truths. · The Spirit of God has individually selected certain spiritual gifts and given those to me. I did not choose my gifts. I received them, because the Spirit of God chose me. · I am here on this earth to speak for Christ – to be His voice, His hands, and His heart, reaching out to others. As Christ ministered to me, I can minister to others. · When I use my gifts, and minister to others as though Christ Himself were ministering through me (which He actually is), I am accomplishing the sovereign purposes of God. I am pleasing my Father. The Spirit of God has gifted the members of Christ’s body to accomplish the purposes of the Father in this world. Are you doing your part?